There are plenty of opinions being tossed around about Tiger Woods’ horde of infidelities, but he’s only the most recent (and well-known) among loads of athletes who have been exposed and scrutinized for stepping out on their marriage. The biggest difference is that unlike some others, Tiger had a squeaky clean image…until now. Many reporters have asked some distinguished and infamous athletes and fellow golfers for their opinions about Tiger’s indiscretions and some have siphoned their sympathetic and non-judgmental analysis. Nobody’s perfect. Everybody makes mistakes. I’ll be the first one to say I’ve made mistakes, as well. Everything you do, people want to know about …. I don’t always think that’s fair. I try to keep things private, you know there are so many things that are made up, people fabricate this story and that story, but you understand it’s part of it. The best thing you can do is manage it the best way that you can. You can’t mirror anybody else’s image…You just have to do it and figure out what works for you and go from there. Everyone needs to find their own way and find their own happiness…Obviously, everybody in this room has some degree of notoriety and you have to understand what comes along with that and try to make the best decisions you can. One problem that a lot of celebrities got…you have to be really careful to try to handle everything. Sometime we give like, well not me because you know I have a strict rule; I don’t want no PR person talking for me cause they don’t make it work… I think he is making a serious mistake…You know I love my boy to death and I don’t know what happened. I want to make that clear. I just told him that I love him and hang in there, but I think he is just making it worse on his self…That makes himself look worse if he doesn’t show himself in public. That is going to make all those rumors that he is scratched up and everything…Nobody is perfect. I mean that is like when that thing with David Letterman broke. I am like what good, I know I am going to get into trouble saying this but I am going to say it anyway, what good is being the boss if you can’t freak with the women that work with you? 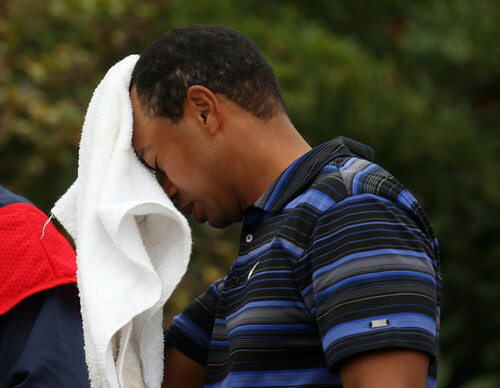 The thing that Tiger needs to look at is, whatever happened, just tell the truth…He’ll get over this. The family will get over it. They’ll move on. I hate for something like that to happen to anybody. I just want him and his wife and kids to be happy and for him to keep pursuing the goals that he had…Tiger’s the biggest asset the tour’s had in a long, long time. Whatever happened, as long as he’s OK that’s all that matters. Golf needs him badly…no doubt. There is a lot of questions there. It wasn’t a question of Tiger was driving down the motorway drunk and knocked somebody down or something like this. This is a more personal thing. Obviously Tiger has been held in high esteem and it is going to be a disappointment to a lot of people. Now that he has come out and said something it is much more of a private matter and it’s much more of a personal thing. I think up until now there was a lot of speculation and interest in it and as I have said the other day I have learned of a lot of gossip websites. It was something that everybody was interested in and as more comes out it becomes more personal and much more of his own business really. He’s trying to make it as private as he can, and it’s just hard, because everybody is trying to get a piece of information on really what happened. I think his image is going to take a bit of a shot. I think I’d like to see him come on TV and just pour it out a little bit and show what’s happened. I don’t know if that will ever happen. And we’ve already heard Jesper Parnevik suggest Tiger get walloped with a driver.